Image: 123RF/AirdaIndia This time we discuss the “people factor” in the timeshare industry and how it can be a powerful game changer. Timeshare is all about a vacation experience in a format that is engaging and entertaining – but the key value additions happen via people delivering quality and efficiency. So what is the customer looking for in the first place? What factors does he consider when he rates a resort in the delivery of services? 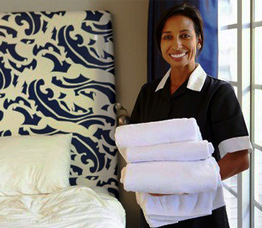 To start with, all customers expect clean environments – and that would include clean beds, clean sheets, clean carpets, clean furniture surfaces, clean bathrooms, clean towels, etc. That list could go on and on, but the focus is on a refreshing, totally clean experience. A customer expects staff response that is helpful and courteous – especially in the areas where he seeks assistance and information. He also expects transparency, clarity and accurate billing for what he needs to pay for – both at the home resort and those he has access to, through a resort exchange company in the network. While these observations are common to all players in the hospitality industry, it is relevant to the timeshare segment which is still new and relatively untapped in terms of overall potential. The right emphasis on training can result in major differentiators in terms of quality of service and overall customer satisfaction. Take a look at the areas where AIRDA resorts score. Resorts in the AIRDA network work hard at placing the right people at the right jobs. They work towards a system of recruitment and training to ensure a sustained level of customer service. Timeshare today offers abundant opportunities for young professionals seeking a career in the hospitality industry. For current and prospective employees it helps to understand timeshare as a product and know the difference between the unorganized sector and the organized self-regulated model under the AIRDA banner. And building awareness about AIRDA guiding principles is what our resorts work towards. At AIRDA resorts there is a clear emphasis on work force planning and management - ensuring adequate numbers, relevant experience, and a clear affinity for the hospitality industry. It’s a process that takes into account modern-day attrition, and the need to fill in gaps along with growth opportunities. The hiring process too, follows the guidelines outlined in the planning process – making sure there’s room for people to grow and specialize within the process of building your career. Timeshare resorts under the AIRDA banner also offer an excellent package – as attractive as the regular hotel industry. The training process at AIRDA resorts is another positive measure in HR initiatives – ensuring the right levels of capability and skills. Training in most cases is not just learning on the job, but a planned, programmed process that aims to match skill sets with individual and team milestones. At the end of the day, every customer, every guest coming to your resort needs to experience that feeling of total comfort – a feeling of belonging. This alone can be a big challenge, because the hospitality industry has so many touch points in terms of service delivery – right from the moment a guest checks in, to the time he checks out. When it comes to customer engagement these days, happy employees make happy customers. And happy customers come back for more. Timeshare in India is still at that early part of the curve in terms of product awareness and acceptance. So picking the right people for the right jobs is most important.